1. CY-150 136 - 174 MHz. 5 MHz. 11 dBic. 2. CY-450 330 - 512 MHz. 15 MHz. 11 dBic. Antenna Experts manufacture satellite tracking antenna for 150 MHz, 350MHz, 400 MHz, and 450 MHz. frequency bands. Satellite tracking antenna for other customized frequency band can also be supplied on request. The circular polarized yagi antenna uses a GAMMA matching feed, eliminating the use of folded dipole. The circular polarized yagi antenna termination uses N-Female connector fixed on the antenna dipole. These Circular Yagi Antenna are highly directional, comes factory tuned and does not require any field adjustment. The feed point radiator of circular yagi antenna is enclosed in a Nylon housing designed to protect against severe environmental conditions and minimize pattern distortion. CY series circular polarized yagi antenna is rugged, all weather crossed elements yagi antenna use 6063T6 ultra corrosion resistant architectural anodized aluminum alloy, is designed for circular polarization. The complete circular polarization yagi antenna is supplied with powder coating finish to protect the antenna further from severe environmental condition.The mounting hardware and all fasteners of circular polarized yagi antenna are made of type 316 marine grade stainless steel. 1. CY-150Q 134 - 174 MHz. 5 MHz. 16 dBic. 2. CY-450Q 330 - 512 MHz. 8 MHz. 16 dBic. Antenna Experts manufacture quad stacked circular polarized satellite tracking antenna for 30MHz, 50MHz, 75MHz, 150 MHz, 350MHz, 400 MHz, and 450 MHz. frequency bands. Satellite tracking antenna for other customized frequency band can also be supplied on request. The quad stacked VHF/UHF circular polarized yagi antenna is rugged, all weather Quad-Stacked Yagi Array for Circular Polarization consist of FOUR Yagi Antennas with crossed elements. 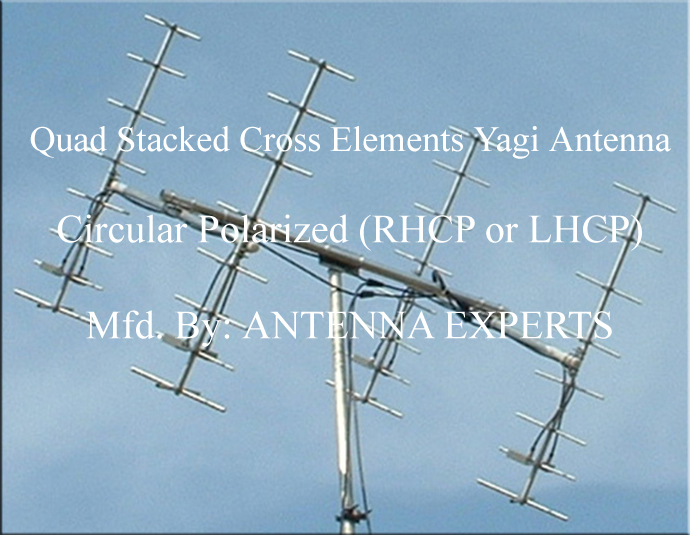 The array of quad-stacked crossed elements four yagi antennas consists of two columns of two horizontally stacked yagis. 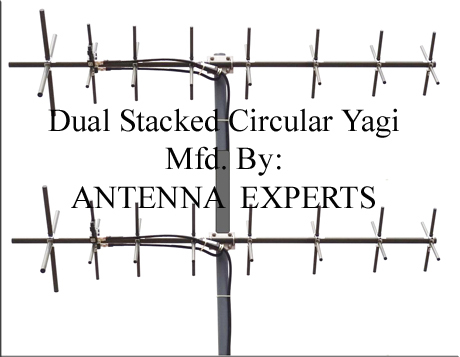 Quad Stacked Yagi Antenna is designed for Circular Polarization with increased gain to 6 dBi. Special mounting hardware is fixed at the centre of the yagi antenna for mounting on a round pipe supplied with the yagi antenna. The Quad Yagi Array is supplied with complete Mounting Hardware balanced at its centre of gravity for mounting on a rotator for azimuth and Elevation plane scanning. For satellite command and control, the transmitting antenna provides circular polarization. Phasing Harness Cable supplied with the antenna helps in field-selection of the desired LHCP / RHCP polarization. For polarization diversity reception the two separate antenna outputs for V&H polarized signals come useful as receiver input. The Quad Stacked Circular Yagi antenna can be configured to work as RHCP or LHCP field selectable by inter-changing the 90 Degrees delay harness cable. These Circular Yagi Antenna are highly directional, comes factory tuned and does not require any field adjustment. This high-gain quad stacked circular yagi antennas use Circular Polarization Antenna Technology - which delivers better penetration through obstruction and interference. The quad stacked circular polarized yagi antenna uses a GAMMA matching feed, eliminating the use of folded dipole. The dual stacked circular polarized yagi antenna termination uses N-Female connector fixed on the antenna dipole. The feed point radiator of circular yagi antenna is enclosed in a Nylon housing designed to protect against severe environmental conditions and minimize pattern distortion. Quad stacked circular polarized yagi antenna is rugged, all weather crossed elements yagi antenna use 6063T6 ultra corrosion resistant architectural anodized aluminum alloy, is designed for circular polarization. The complete circular polarization yagi antenna is supplied with powder coating finish to protect the antenna further from severe environmental condition. The mounting hardware and all fasteners of circular polarized yagi antenna are made of type 316 marine grade stainless steel.